Grades: 2-8 8:35 a.m. - 3:05 p.m.
Grades: 2-8 Wed. 8:35 a.m. - 1:50 p.m. The Campbell Drive Elementary family welcomes you and your children to an exciting and productive year. I am honored to be the principal at Campbell Drive Elementary. I would like to extend my warmest welcome to everyone during this new school year, as the faculty and staff at CDE is committed to steering our students to higher levels of academic success. 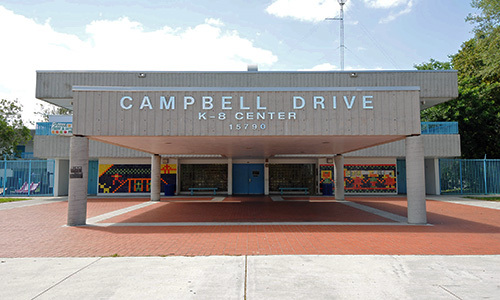 The children of Campbell Drive are the foundation of the school’s vision, which is evident in the caring faculty and support staff dedicated and committed to excellence. I vow to work with all stakeholders in the greatest effort to continue to raise academic standards and cultivate new roads that will sustain an environment which fosters a sense of emotional support and social well-being. We are convinced that in order for children to have a successful education there must be a positive and strong partnership between the home, school, and community. Therefore, I encourage you to continue taking a great interest in your child’s educational experience by participating and volunteering. Parental involvement is a key component to student progress and we at CDE encourage parent participation. We urge you to keep in touch with our staff, to ask questions and make suggestions. Working cooperatively, we hope to provide every student with the opportunity to develop his/her potential to the fullest. Join us as we continue this quest to make our school the very best!